Adults tend to be small and golden in colour and tend to hop rather than fly. The larvae are creamy white with brown heads and can create a lot of damage to woollens, carpets and soft furnishings. They are about all year round. The first sign of a problem will normally be holes in your favourite woollies or your carpet. How can I tell I have a problem ? 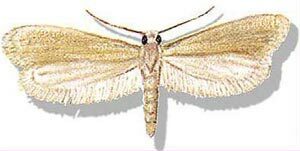 - If you are seeing adult moth regularly then the problem is advanced - most people get textile damage before they see the adult moth so it is best to act fast!